Sable, a 3-year-old mare, was deemed severely malnourished after being taken into Bureau of Land Management custody last week. Its important to get out the word for any kind of animal abuse or neglect, said Pati Temple, a board member with the Colorado chapter of the National Mustang Association. Three formerly wild mustangs are in Bureau of Land Management custody after being confiscated from their owners last week. 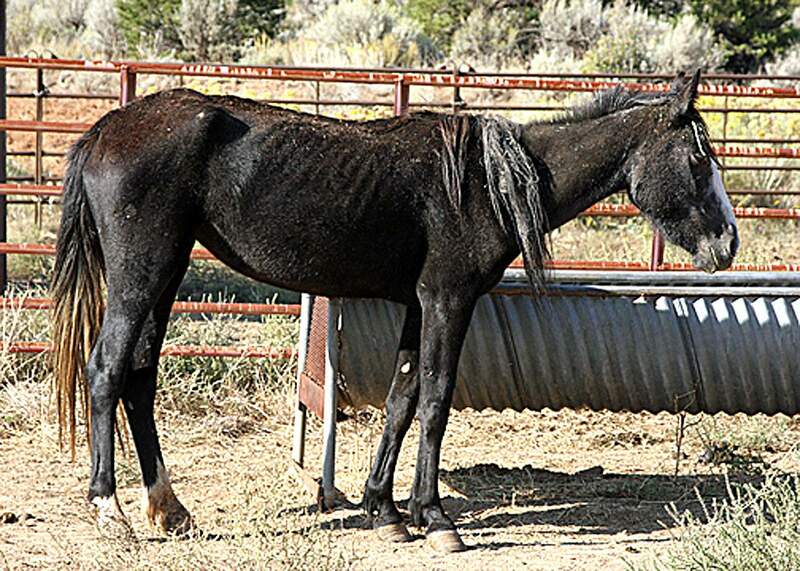 Ray and Wendy Williams, who live in Cortez, surrendered ownership of the equines after photographs showed them in a severely malnourished state. The horses originally came from the BLMs Spring Creek Basin, one of four Colorado ranges were mustangs roam freely. The basin encompasses 22,000 acres of the Disappointment Valley, southwest of Norwood. About every five years, the BLM conducts mustang roundups and adopts them out to prevent overpopulation, spokeswoman Shannon Borders said. Whenever we receive a call about our adopted horses, we go out and assess the situation. In this case, the horses were not being fed and were willingly relinquished, she said. The two mares, 3-year-old Sable and 4-year-old Ember, and 3-year-old stallion Whisper, were adopted by the Williamses after the September 2011 roundup. Last week, they were reported to the BLM as looking neglected and weak, said TJ Holmes, who documents and writes a blog about the Spring Creek herd. Thats as bad as it gets, she said, adding that two local veterinarians are caring for the horses. The Henneke scale ranges from 1 to 9. Horses with scores of 5.5 to 6.0 are considered in good condition, according to the University of Maine Cooperative Extension. Holmes and her colleagues also contacted the Montezuma County Sheriffs Office because the Williamses have other horses. It was unclear Tuesday whether the BLM or Sheriffs Office would investigate further or file legal charges. Holmes praised BLM personnel for responding quickly. She became aware of the horses predicament last Tuesday and they were picked up the next day at about 6 p.m. Without natural predators, the Spring Creek mustang population can balloon unchecked, said Pati Temple, a board member with the Colorado chapter of the National Mustang Association. To keep a healthy balance, you have to either put some horses up for adoption and domesticate them, or do fertility treatments, she said. The BLM and NMA are trying to promote fertility treatments as the first-choice option because good adoptive homes can be hard to find. Porcine zona pellucida, a protein derived from pig ovaries that blocks fertilization, is administered from a distance with a rifle-powered dart. The contraceptive effects last about two years, according to the Humane Society. Adopted mustangs, despite being born and raised in the wild, can be domesticated over time. Diane McCracken of Spring Creek Horse Rescue (unaffiliated with the mustang range) has noticed a sharp uptick in the number of owners trying to unload their horses for cost reasons. The three BLM mustangs will be nursed back to health and transferred to a new adoptive owner or long-term holding pasture, Borders said.